Benefits of PaaS : discuss. Some thoughts on the benefits of Platform as a Service, to support operational and development environments. In particular, an open source PaaS. Would welcome comment and feedback. For further reading on PaaS benefits see the list below. Be wary of some claimed benefits or disadvantages as many of these are specific to a domain or commercial providers business model. The PaaS platform covers development, test and production, providing significant benefit for development through automation of integration and deployment tasks, speeding up the velocity of development. Getting greater efficiencies from the development and the operational processes. Be able to deliver future projects and meet the challenges they will provide. PaaS architecture, such as provided by Red Hat’s OpenShift are based around software containers which in turn allows for logical separation between application platforms. However to make this happen, any existing application destined for a PaaS architecture needs to be designed in a ‘cloud native’ way and as such needs a rewrite rather than just a replatform. PaaS deployments can be fully automated and therefore happen both quickly and on demand. It would be envisaged that a PaaS platform would be constructed either from a fixed list of components or from a predefined menu of options. As well as reducing time spent requesting (and waiting for) environments, PBI will ensure consistency in reproduction for different environments. As well as including the operating system, the PBI will include development tools, monitoring and other infrastructure tools as standard, already built and configured for the environment. Having a PBI deployed via the PaaS will require the PBI itself to be developed (rather than operated) and will have its own Continuous Delivery pipeline. It will in effect be software (Infrastructure as Code) and similar teams and processes as a application development project. 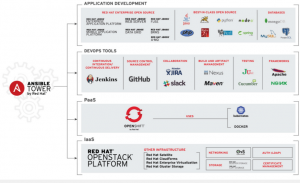 Figure : Push-button infrastructure tech stack used as part of Red Hat Open Innovation Lab. It includes development platforms and tooling as well as links to commonly used services. A PaaS would provide a limited menu to projects to select an appropriate platform based on performance, likely cost and the stack required. This would have restrictions on the applications and tools available to developers, as well as versions, though it would ensure the use of enterprise ready software. Ensuring skills and knowledge between stacks is good and that staff can be transferred between projects. Using a PaaS platform, with the characteristics it provides does provide some level of predictable cost, which can be charge based on platform sizing and function. Alternatively some form of chargeback or cost indication could be based on utilisation. Any costings, real or relative, will be using when comparing on premise hosting versus public cloud service provision to make a real estimate of development and operation costs for a platform. In a typical development world, there are a number of projects being developed at any one time, within a framework of Discover, Design, Deliver, Operate, Retire. At the same time taking advice from organisational functions (such as Enterprise Architecture, Security, Change Management etc). Through automation, checkpoints and best practices can be automatically applied or check pointed if a development process is using a viable PaaS platform. It provides the ‘junction’ that link these two different groups within the organisation together. Support for Coding Standards and Design / Architecture Best Practice. As with many organisations, there are no standings for architecture, design or coding that are implemented organisation wide. . These could be included images deployed on the PaaS, as mandatory policies for testing for example. Coding templates and standards could be included in the IDE or Dev environments and therefore be in place to encourage usage and adoption. Previous Post:SEMAT Essence and open source ?